Co-authored with Jeffrey Coolwater and Carter Felder. First published on Ecorazzi on 16 October 2017. The following are experiences from the “How Do I Go Vegan? Ask Here!” booth at each of the Vegan Food and Drink Festivals this summer. Sometimes, creative, non-violent vegan education, means talking to hundreds of people in one day and other times, it means talking to one. Go out there and do it. And if you are interested in joining us next year, please message any one of us. Sometimes, you don’t choose creative vegan education; it chooses you. That is what happened in Chicago this summer. The shipping company delivered all our materials to St. Louis instead of Chicago. On our table, we had nothing other than our fantastic sign. It was a beautiful and breezy day so we stepped out from behind the table to make all visitors feel welcome, making up for its emptiness. My advocacy is generally one on one, or it is via writing or cooking. I had never participated in anything on that scale – 10,000 attendees… yikes. I did not know what to expect. What we got was a consistent stream of visitors, vegan and not. My approach was open, humorous, friendly and informal. I listened, shared information and addressed concerns. There is no doubt that people understand an unequivocal and clear vegan message and I respect people enough to speak the truth and let them decide for themselves what they want to do. There were a few memorable moments. Annie was a long-time vegan and she wanted her friend Angel to hear the message from someone else. Hearing an unequivocal vegan message about veganism as a matter of social justice was a revelation for both of them. At the end, they were both beaming. Angel hugged me, said he understood and would go vegan. Then, there was the vegan son who brought his non-vegan mum and asked me to give her “my sales pitch.” He needed her to hear a clear and logical message. He needed that support certainly more than she wanted to hear it. But she listened carefully and silently, a testament to her love and respect for her son; a seed, to be sure. The most memorable moment, however, came when I took an uber to the airport early in the morning after the festival. I decided to sit upfront with the driver, a tall and broad African-American man in his late-30s/early 40s. We got to chatting about Chicago and what I was doing there. When I told him, he said he had a long-term vegan friend whose parents were also vegan. He said, “you’re an educator, tell me why go vegan.” His friend had never discussed it with him. So I asked him how he felt when he saw animals mistreated. He thought it was horrible, he said. Then I asked him what the difference was between the animals we eat and those animals we don’t. He was silent for a bit and then replied, “nothing. We say they are different.” We talked about that. I told him how dairy milk and eggs are produced. He had no idea. He turned to me after a very long silence and said, “this is monstrous.” We talked more. He was incredibly perceptive, funny and got it. We arrived at the airport, he got out of the car, helped me with my bag and said with arms outstretched, “oh no, you don’t. Come here! I believe the biggest gift you can give someone is education. And you have changed my and my family’s life forever.” You bet I was in tears when we hugged. He emailed me several weeks ago. He is vegan. The weather was a beautiful, partly sunny 24ºC (75ºF). Despite festivalgoers enduring long lines at virtually every vegan food vendor – 100 of them! – we had a constant stream of inquisitive, receptive and congenial visitors right from the start and until after closing. We spoke to hundreds of people and only took a 20-minute break! We found a short line at Yam Chops’ booth where we got delicious vegan schnitzel with fried onions & mushrooms, tomato sauce and hot peppers on a bun. We could have easily occupied three or four more volunteers (whom I MUST find for next year). 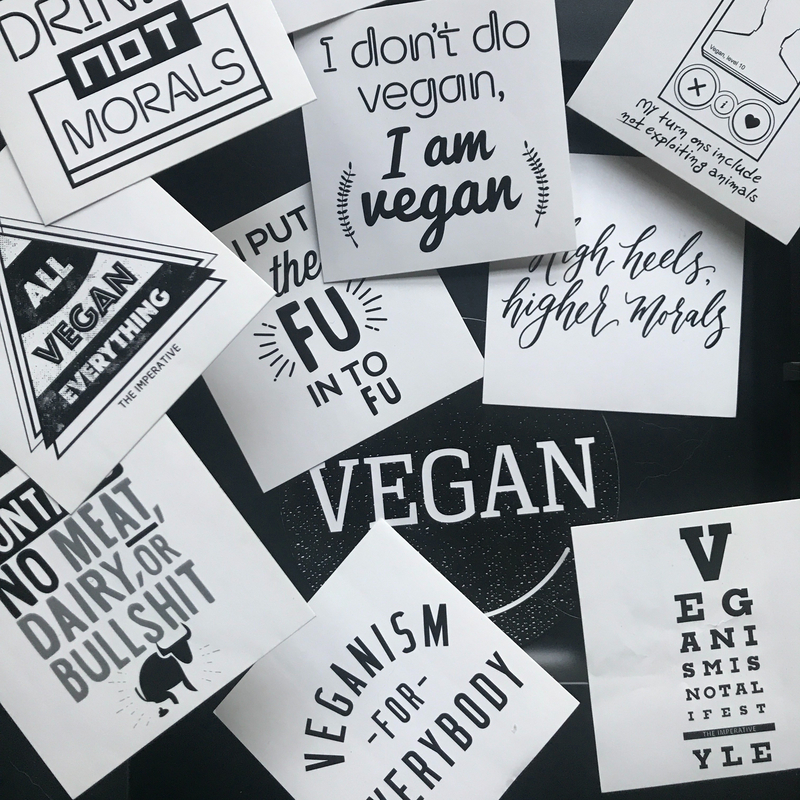 The most fulfilling and encouraging encounters for me were with the countless people who either nonchalantly or almost apologetically, when I asked if they were vegan, opened with, “I’ve cut out red meat” or “I only eat fish” or “I’m addicted to cheese” or “I only drink milk”. It was extremely valuable to let them speak it all out, for me to mindfully listen and only then engage. The most surprising aspect of our booth for our visitors was that we were neither seeking nor allowing donations. One particularly memorable moment was with a young vegan woman who was looking at her non-vegan boyfriend and nodding her head as I spoke. As they walked away, I saw him gently take her hand. She looked at him and said something. He looked back and replied. I could not hear what they said, but they kissed. I like to think that their brief conversation was a vegan beginning. This was my first experience in a vegan education setting and I loved it. I spoke with so many people during the day and there was no serious tension in any interaction I had. One woman took offense to my stance on the need for vegetarians to go vegan. I reassured her that I was not judging her or anyone else. The focus of my discussion with her was on the injustice toward animals. I believe it is important to remind people that our only aim as advocates is to encourage nonviolence toward animals – that’s all. Some visitors to the booth looked around, but said nothing. However, I believe that you are still planting a seed if you can get their attention, respect their silence and lock eyes. One person pretended to be non-vegan, but after I spoke with her, she said she just wanted to see what we were doing. That’s fine! Other visitors just wanted to talk about their life and what they are passionate about. This situation is a little tricky, but it’s important to remind them as nicely as possible that you’re here to educate people about veganism. Many non-vegans showed very real interest in going vegan, while others were excited to read the materials we distributed. All of us at the booth spoke passionately about our belief in veganism without any anger, hate or frustration. We spoke with love because that is how we will end the hideous violence that results from our use of animals. The authors extend a sincere thanks to the International Vegan Association for providing the booklets to distribute and to Gary Francione and Anna Charlton for writing Eat Like You Care, which is an effective resource for going vegan and for learning to talk about veganism. Going vegan is easy. This website shows you how and has many resources, including mentoring. Next articleEcorazziIf We Can't Reject Exploitation, Why Do We Expect The Patriarchy To Change? This cannot be stressed enough. I see it happen so often in online discussions as well that people take given information about animal rights as a personal condemnation. It’s not. Thank you for reading and commenting, Trudi!!! And YES!! Completely agree. All too often advocacy becomes theatre or a vehicle for self-aggrandisement/moral superiority. And the advocate forgets that it’s not about him or her, but about the subject of the advocacy. Thank you kindly for creating this brilliant article, dear Emi’s Good Eating! It was an honor to be doing the vegan tabling in New York and I look forward to doing it again this year too! Thank you wholeheartedly for all you do for the animals!